I want to bring my five decades of business management and marketing prowess to the artist community. I want to eradicate the concept of “struggling artists”. Hear me now: Artists do not need to struggle. I want to help those who are driven by undeniable (often undefinable, but always creative!) ideas on how to make a living on their own terms. What is your greatest obstacle? Is it your website? Your marketing? Do you struggle with one-on-one selling? Are you making money or losing money with your current prices? Have you wondered if you should try wholesale? Do you know what social media channels to use and which ones to avoid? Are you considering using email marketing but don’t know how to start? Again, what is your greatest obstacle? Let’s talk about it. Set an appointment for free. Everyone gets free advice from time to time from a friend, a family member or another artist they follow. My free advice is no strings attached and focused on your long term success. The only difference from my free advice and a friend’s free advice is I will be brutally honest and have 50 years of experience behind every word. So let’s talk. I look forward to sharing my obsessive nature with you and helping you find the marketing path to a successful, independent, and sustainable income stream. Set up a free appointment! I have a long career in sales and marketing. I had my first business at the age of seven (with two employees!) selling hand-made potholders. The full story is captured in this short podcast. In the mid-’70s through the ’80s, I ran big operations and small operations in San Francisco. I sold millions of dollars of fine art and other collectible objects. Eventually, I had a consulting practice in the late ’80s privately coaching and teaching sales training to artists, art consultants, and other others involved in rare specialty objects; antiques, rare car dealers. In 1992, I started my own wearable art jewelry line. The line was sold to hundreds of fine galleries and shops, including Neiman Marcus, and, despite my intentions for retiring the line, I still create for a dozen or so locations. There are over 50,000 pieces roaming the planet. It’s hard to stop creating art, right? And so, with over 50 years in sales, marketing, and business management, I eventually have turned my main focus to My Golden Words. I have built My Golden Words into a vibrant resource for small businesses – specifically the artist community. I began sewing the seeds for this gradual shift in the mid-2000s as I increased my appearances teaching E’s of Selling Art System Seminars at live events and Skype gatherings. I became a Certified Solutions Provider with Constant Contact. Joined Arts Business Institute faculty as a workshop presenter and guest blogger. Did numerous guest blogs and interviews with several established art industry leaders, including Carolyn Edlund of Artsy Shark, Alyson Stanfield of Art Biz Blog, and Connie Mettler of Art Fair Insider. Became an Authorized Local Expert with Constant Contact. Co-authored E-Course, “The Artsy Shark Success Guide to Email Marketing for Artists” with Carolyn Edlund of Artsy Shark. Officially launched www.mygoldenwords.com blog. Continued growing my speaker engagements. It was a very busy year and I was still making lots of jewelry, too! Increased speaker engagements including travel to other islands and Mainland US for seminars, private coaching, and consulting contracts with my local county government teaching artists how to grow a wholesale business. Certified as a Marketing Authority after completing a course with HubSpot. Maintained my certifications with Constant Contact including Platinum Solution Provider. 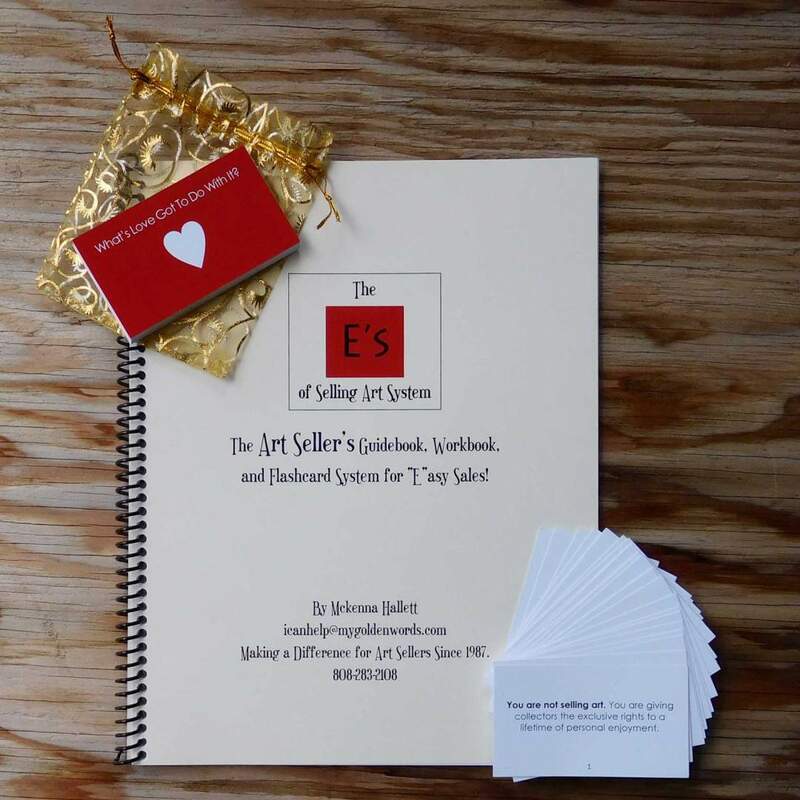 Published the “E’s of Selling Art System – Guidebook, Worksheets, and Indespensible Flashcards“ and added a NEW blog based on the new publication. So the two blogs are every other week. I began blogging every week! It’s noteworthy that in the midst of growing my consulting practice, I continue to run my hand-made jewelry studio and still maintain active wholesale accounts across the US and though out my home state of Hawaii! Started the “Find Loving Homes for Your Art” podcast! Still blogging about marketing art – just a little less as the podcast is a big focus for now. And yes, I am still making jewelry. I love being an artist and can’t quite quit my (nowadays) side gig. BIGGER and BETTER news is always on the way! Stay in touch!